The issue of the Assyrian genocide is of paramount importance to all Assyrians regardless of their tribal, sectarian or geographic backgrounds because the indiscriminant horrors our ancestors were subjected to (and still are in the Middle East) decimated the Assyrian nation and the consequent scars are still with us. In order to properly understand the magnitude of the Assyrian genocide, it is important to note that the Assyrian genocide was not a single event in Assyrian history perpetrated by one player, but rather sadly, a reoccurring event in Assyrian history perpetrated by Mongols, Ottoman Turks, Kurds, Persians and Arabs dating back to the Mongol invasions of Mesopotamia by Hulagu Khan and Tamerlane in the 13th and 14th centuries respectively. Politically, the most common episode of that genocide is the Seyfo atrocities committed by the Turks and Kurds against Assyrians and other Christian minorities in the Ottoman Empire (Greeks, Armenians) from the 1890s-1925 in which upwards of 700,000 Assyrians were massacred. 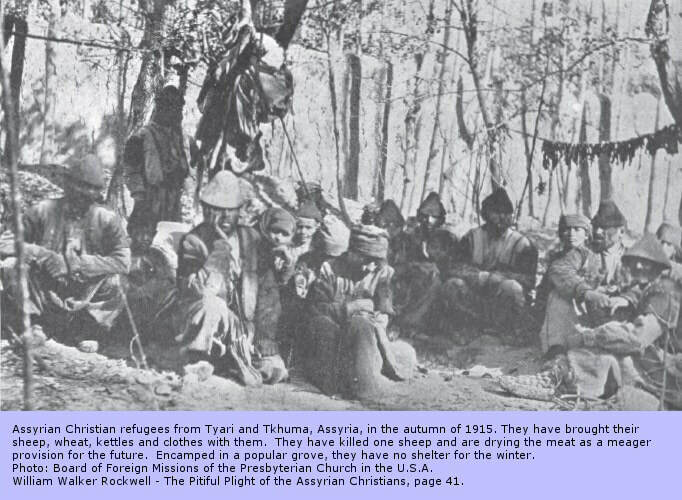 As Assyrian Christians, the Tyareh tribes did not escape the horrendous genocide inflicted upon Christians of the Ottoman Empire which is why they were forced to flee Hakkari in 1915. Although the independent Assyrian tribes of Hakkari, the Tyareh tribes being foremost among them, were combative in nature and inherited a sense of martial arts from their ancient ancestors, their military prowess was solely used to defend their way of life or avenge atrocities committed against them. This fact must be emphasized because there are pernicious claims by Kurds and Turks that the independent Assyrian tribes of Hakkari were not victims since they were a militant people and engaged their enemies in battle. According to the logic of this claim, if a people defend themselves against barbaric attacks, anything done to them is fair play because they chose to defend themselves, which is absurd to say the least. Genocides, mass atrocities and slaughtering of innocent people are never permitted under any international or moral law even if people defend themselves. The genocides perpetrated against Assyrians are not subject to interpretation; they are explicit facts. For example, when the Kurdish prince of Bohtan, Bader Khan Beg, decided to attack the independent Assyrian tribes of Hakkari starting with Upper Tyareh in 1843, he did so unprovoked under blatant and explicit ethno-religious hatred of Assyrian Christians. His main intent was to weaken Assyrians in Hakkari and he did so by attempting to exterminate the most formidable of the independent tribes of the Assyrians, mainly Upper & Lower Tyareh as well as Tkhuma. When Bader Khan attacked Upper & Lower Tyareh in 1843 and 1844 respectively, the men of Tyareh defended themselves ferociously and inflicted heavy losses on their enemy but were greatly outnumbered (10 to 1) and consequently lost the war. What happened after their territories were invaded by Bader Khan’s armies is a tale of anguish for Assyrians, particularly for the Tyareh tribes. The barbarity committed against the civilian population was unprecedented according to numerous sources such as The Nestorians and their Rituals by George Percy Badger, Discoveries at Nineveh by Austin Henry Layard and many other sources. Tens of thousands of women and children were enslaved, indiscriminate barbaric massacres took place of men, women and children and their entire towns were wiped out including the desecration of ancient churches. I ask the reader, was this not an act of genocide? Of mass murder? Of inexcusable atrocities? Can anyone point out to me if and when Assyrians massacred or enslaved thousands of Kurds or Turks or attempted to exterminate their nations? Now imagine this horrific episode a reoccurring event in modern Assyrian history. To this day Assyrians are persecuted in the Middle East, sadly, by the same nations that committed genocides against them but were never held accountable.